Welcome to The Abso!ute Sound online! We explore music and the reproduction of music in the home. We believe that the sound of music, unamplified, occurring in a real space is a philosophic absolute against which we may judge the performance of devices designed to reproduce music. Our goal is to provide the resources consumers need to judge how a component's sound either honors or departs from the music's truth, and to make sound purchasing decisions that maximize their experience of reproduced sound. 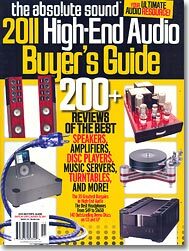 Below is our Issue 207, Spring Buyer's Guide 2011 table of contents and link to the editorial. Robert Harley on what a high-end audio system really is. Andrew Quint offers the controversial view that multichannel audio and DSP room correction have brought high-end sound quality to mass-market prices. Robert Harley explains the language of critical listeners. Wayne Garcia reminisces about the role of the demo disc. Our editors and writers each name their 20 top recordings for assessing sound quality. Robert Harley explains how the three basic types of loudspeakers - cones, electrostats, and planars - turn signals into sound. Proof positive that high-end audio doesn't have to mean high-priced audio.